He was so small when he was rescued that he had to ride on someone's lap on the drive home. Munchie is different than most of the horses at Habitat for Horses, a sanctuary in Hitchcock, Texas. 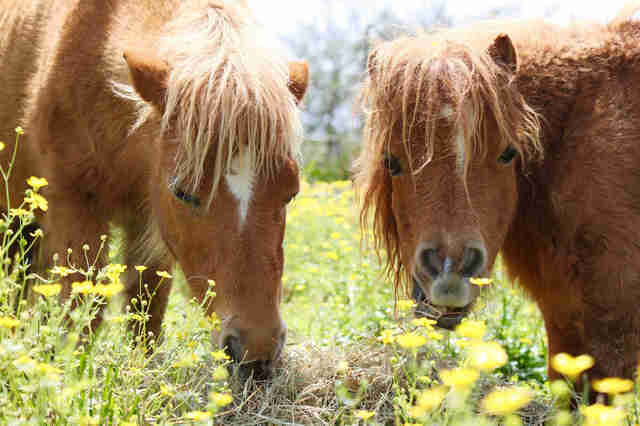 The average horse there is about 5 or 6 feet tall. Munchie, on the other hand, rises 21 inches off the ground, which is less than 2 feet. 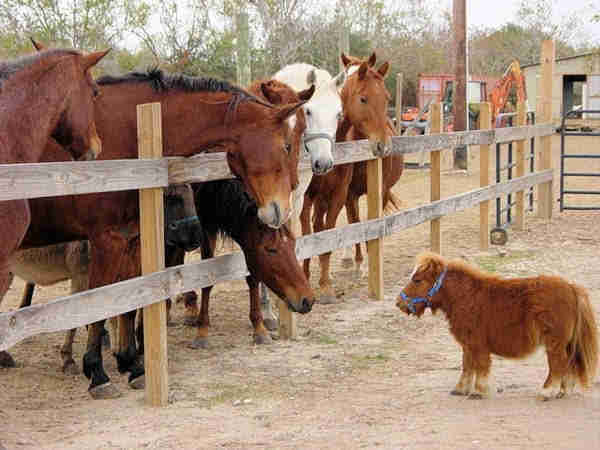 But Munchie’s size has never affected his confidence. Before Munchie came to live at Habitat for Horses 11 years ago, he was living in a state of neglect on a property in San Antonio. 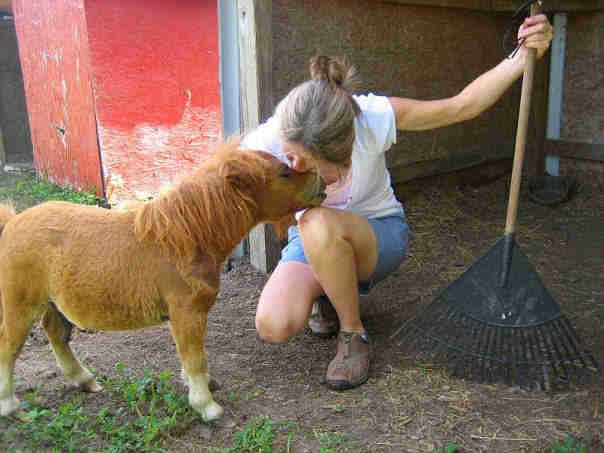 After police officers seized the animals, most of them went to live at Habitat for Horses, including Munchie and his mini horse mom, Melanie. 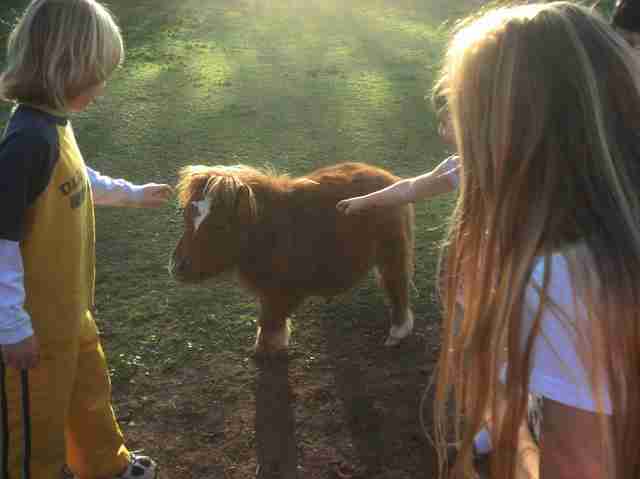 When the sanctuary team got a good look at Munchie, they realized he wasn’t an ordinary mini horse — he was a mini horse with dwarfism. 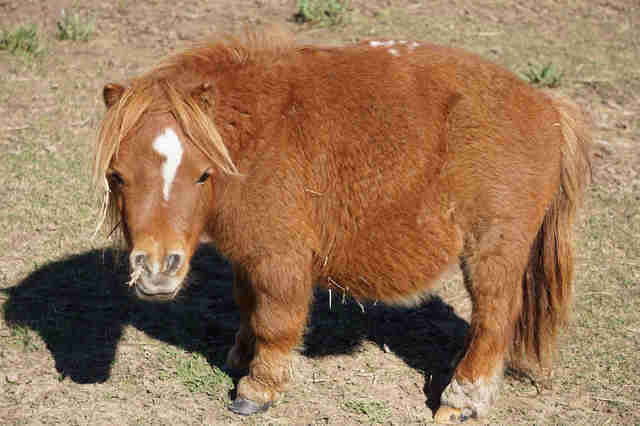 Sadly, dwarfism is a common issue seen among mini horses, since they are sometimes inbred by negligent owners, Barnes explained. Thankfully, Munchie is relatively healthy, although he does have a curved “roach” back and an underbite. “It’s actually pretty cute when he looks at you and he licks his lips,” Barnes said. He also has a bulging tummy because of his dwarfism. 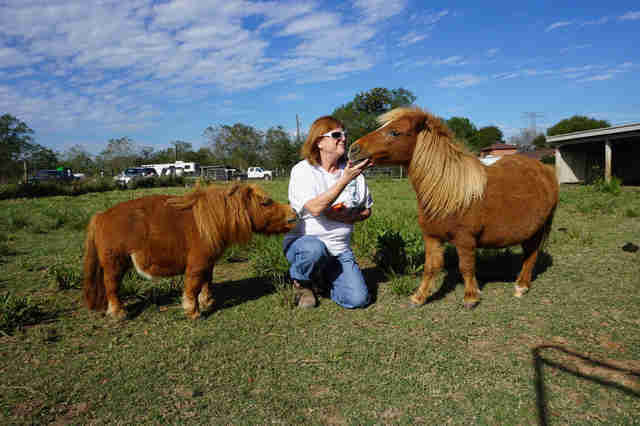 “He has a big potbelly because a lot of his organs are regular sized — not all of them, but they’re bigger than what would make sense in a horse his size,” she said. But none of these things seem to affect Munchie’s quality of life, according to Barnes. Like the other animals at the sanctuary, Munchie spends his days eating, napping and exploring his pasture. 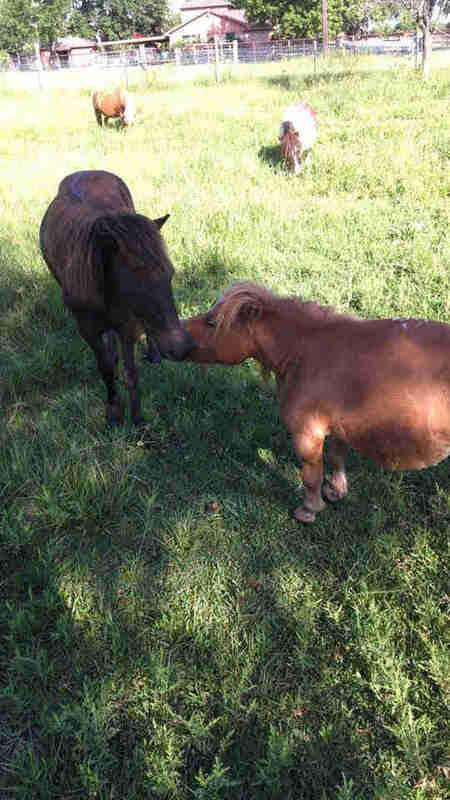 In Munchie’s case, he shares a pasture with four other mini horses, including Gizmo, who also has dwarfism, as well as goats and a pig. Munchie also takes every opportunity for a good pampering session. 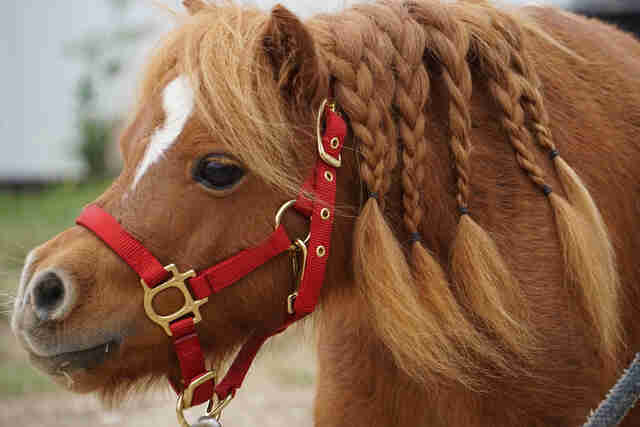 “Munchie loves being groomed, so he likes getting his hair brushed out and braided,” Barnes said. 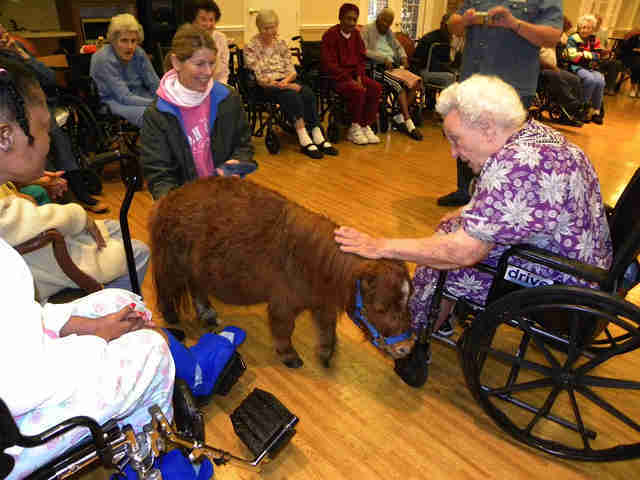 He also visits nursing homes. 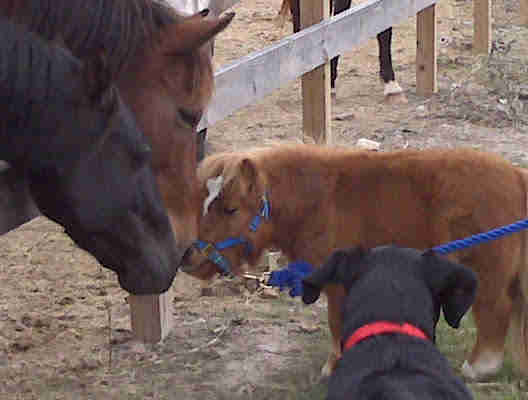 And whenever he gets the chance, Munchie will show the larger horses that he’s not afraid of them — although they’re often afraid of Munchie, according to Barnes. 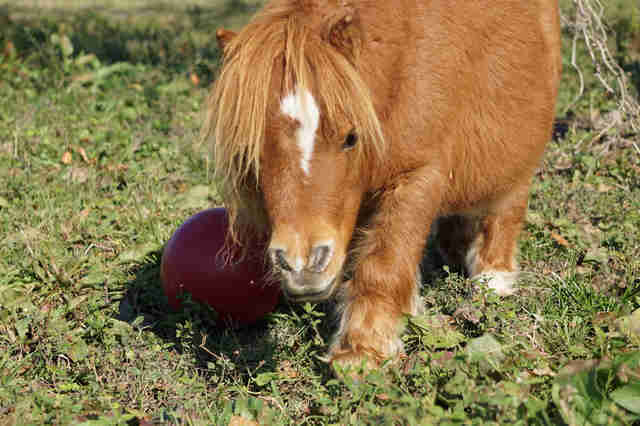 To help Habitat for Horses rescue more animals like Munchie, you can make a donation. You can also follow Munchie's adventures on Facebook.